The sounds that comprise speech are paired into two categories: open and closed - the vowels and consonants, and the voice and unvoiced. 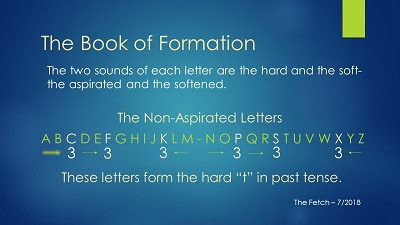 In the article article "The Sepher Yetzirah, Setting Number to Letter", we began a comprehensive understanding of sound as they are being set to number in English. What we learned is that the unvoiced letters, the unaspirated, are set at precise locations in the Alphabet. Counting forward, the numbers are 3,6 and 11. The letters placed at 11, the K and X, share design similarities, while the X contains within it sounds from the C, K, and S. The number 11 is unique in that it is -3 from the end of the half of the Alphabet. Since each half of the Alphabet is 13 letters in length, counting in reverse, the 11(forward) is the 3rd letter in reverse. We may say that the unvoiced, or the anaspirated, are intricately linked to the 3, while the Letter T, itself unvoiced, yet rarely invoked as being so, is placed at 4. You may try to discern precisely why this is so should you care to "know theyself", but we will address this later. In a manner of speaking, we begin to see a binary pattern forming. We can place consonants, or the closed, as a 1, and the vowels, which are open, as a 0. We can then divide the Alphabet in half which then reveals that the letters A and N would each be placed at the number 1. A is open and N is closed. Why is this of interest? Because we begin to see a pattern of speech where the ARTICLES of speech, the words A, AN, and THE, are really working on a principle of opening and closing. The OPEN letters, the Vowels, are A, E, I, O, and U. If the noun starts with a vowel (open), we use the article that is closed (AN), thus creating a sequence of "closed-open" or "open-closed". We ONLY use A and AN if the noun is a SINGLE unit, or 1, and of course, A and AN are both located at number 1. If this sounds etheric, it is not. There is A (OPEN) Bird (CLOSED) on the wall. A is open, the letter B of Bird is closed. There is AN ELEPHANT in the room. The N of AN is CLOSED, while the E of Elephant is OPEN. 1 -5 -9, ⅀ 1:5, and ⅀ 1:6. These correspond to the Letters A, E, I, O, and U, respective. In the first 9 digits (A - I), these can be reversed so that the I, placed at 9, is 1, equally, which is preserved well enough in the Roman numbering system. Now we must make a philosophical, reasoned inquiry. Is 10 simply another 0? Actually, it is. There are 9 digits plus 0. If we then allow for the J of 10 to be another 0 start point, then the Letters O and U are actually set at 5 (0) and 1 (U). Thus, if you set the Alphabet into a sets of 10, with the 0 being the start point, the 10 and 20 become 0's, the vowels then are set at essentially two logical places: 1 and 5, as the letter U would be 1 and the "sometimes vowel Y" would be set also at 5. This would imply that the Letter Z would also be a 0 start point, for in reverse, the Z zero start point would, in reverse, make the Y a 1 and the U a 5. The VOWELS, we may now surmise, just as the unvoiced letters which take the number placement 3, are set at precise integers, namely the 1 and the 5,with the 9 taken also by the letter I, which is itself 1. Once the Alphabet is placed into its PHONETIC matrix, which I termed "The Isisian Codes", we now see that the vowels indeed fall back into these exact number patterns, equally. The Letter U, which could be said to have a value of 1, is always paired with the Letter Q, which is, itself, placed at location number 1. The Letter U also returns back to the placement of Number 5, while the letter Y, which would have 1 start point if we allow for a ZERO Z start point, is placed with the Letter I, which itself is a number 1 and 9 equally. The Letter Z disappears. It is ZERO. Perhaps the word ZERO is telling us that Z is R(our) 0. The Letter O and U become co-relative viewed letters relative to number in that ⅀ 1:5 is 15, the placement of the Letter O, which then may be viewed as its co-relative 5 within the formula ⅀ 1:5. Even if we were to write the formula as ⅀ 1:O, which would then be ⅀ 1:O (15), the total comes to 105. No matter. If we hand the number 15 to a "numerologist",, they will add 1+5 and arrive at 6, the letters placement in the Isisian Codes. If we provide them with the number 105, they will still arrive at 6, even as it is ⅀ 1:5. Equally, the Letter U placed at 21 (⅀ 1:6), but if we were to use the formula ⅀ 1:U (21), the value is 231. We can then give this to a "numerologist", who will add the digits 2+3+1 and return it back to a 6, but as we see above, using Z as a start (O) point, the Letter U returns back to 5. If we say the word THE, the E takes on the sound of the Letter U, as in UNDER, it takes on the value of 5, or E, while if we use the Letter U as a long vowel (its name U), as in UNION, the sound takes on the Letter Y as to say younion, which then is either a 1 in reverse using the Letter Z as a ZERO START POINT, or a 5, if we use the 20 as a ZERO START POINT. Again. No matter. We have shown that the vowels are NOT randomly placed, but placed, as the unvoiced or unaspirated letters, at precise mathematical points in the Alphabet. Superb content as usual & I'm always delighted to see new articles here. My only suggestion would be a follow-up to this utilizing more illustrations as a support mechanism to your article content. What can I say? - I've grown to be spoiled with your usual great supporting illustrations showing what you are articulating in a visual fashion. 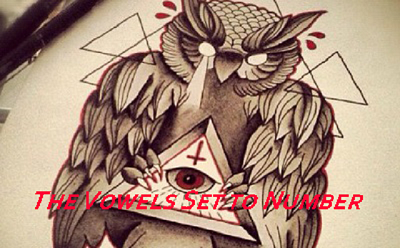 Plus, I feel that vowels is an important facet to the Cabala. Nonetheless, excellent, excellent...! Thank you, Fetch! Hi. This article NEEDS more graphics and I knew that when I posted it. I just wanted to get the darn thing up and was a bit lazy! Kinda funny how just when you think nobody is paying REAL attention, someone like you reminds me that giving less than full effort will always get noticed. It is not so easy to write all this AND do the graphics, but I was honestly thinking along lines as you just noticed.